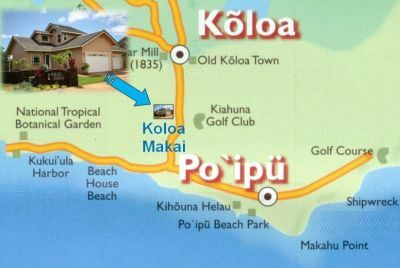 The luxury townhome condominiums of Koloa Makai are located on the south side of the island near Poipu, Kauai's big resort area, famous beaches, and championship golf courses. Fine neighbors include the luxurious Koloa Landing Condominiums, Koloa Estates and the new Kukui'ula community of high-end luxury homes. 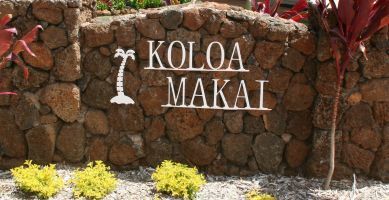 Koloa Makai is part of the historic town of Koloa. These homes exhibit exceptional craftsmanship and attention to detail. Arranged in a duplex configuration, each townhouse unit features a 2-car garage and it's own back yard. They come in 2 and 3-bedroom configurations and all have 2 baths. Living area is 1,286 square feet. They are fully insulated and have central air conditioning. As of the beginning of 2010, 4 units (2 buildings) have been completed and there were plans for up to a total of 17 units when complete. To the best of my knowledge as of 2017 no additional units have been built, something that is confirmed by county tax records.